Tales from the Duck and Cherry: Mice in the Walls? It's night time. Probably winter, as it is still dark outside and the birds are quiet. I wake up from a vivid dream and know that I have to write my thoughts down. If I wait until morning breaks my memory has slipped and I don't remember the clever details from a dream which has a great story line or an idea or two for my writing. So I fumble in the dark to find the paper and pen always ready on the night stand. Quietly, I don't want to wake up Arnfinn. He sleeps poorly and needs whatever sleep he can get. I don't want to disturb his much needed rest. I write in the dark. Scribble funny letters on a paper I cannot see. My memory is still cooperating and the dream is preserved--though poorly written--on a piece of paper on the sheet under my duvet cover. Then Arnfinn moves. Ah, he speaks. Did I wake him up? "What is that?" he says. "What is that scratching sound? Do we have mice in the walls?" There you have it. A man who is very happy that there were no mice, but instead a wife, even stranger than before, one who writes in bed in the dark. 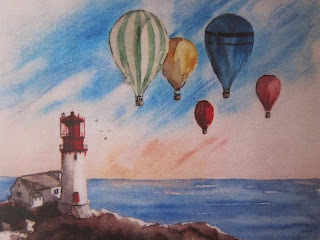 Today's water color is of Lindesnes Lighthouse in southern Norway.